Our cryptocurrency day trading guide will teach you everything you need to know about how to start day trading crypto currencies using real examples. First, we will go over the necessary steps for opening an account and how to operate it. 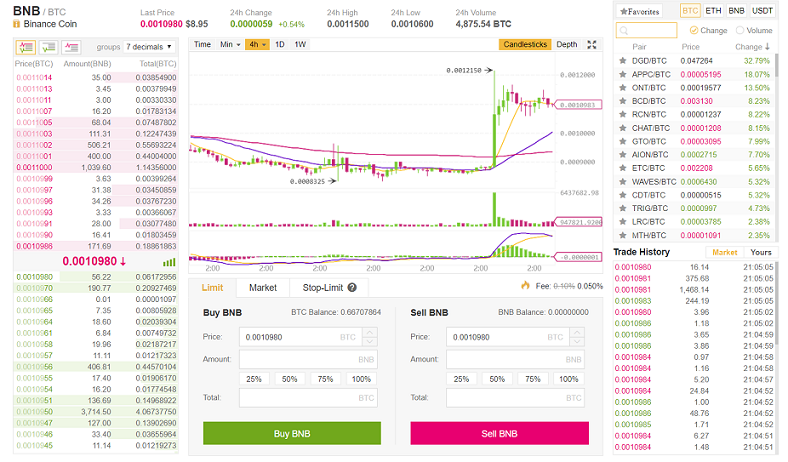 The exchange we are going to use for this purpose is Binance, which is the most recommended platform for day trading. It offers friendly trading tools, easy and cheap transactions, and a wide range of available digital coins you can trade on. You can learn more about this exchange by reading our Binance review. Fill in your information. Enter a valid email address and choose a secured password. Then, after approving the terms and conditions document, go to “Register” and complete the captcha. Open your mailbox. You will find a verification message. Click on the provided link to confirm your email address. From there you will be directed to the main site. At this stage, you should get to a “successfully activated” page. Click “Login,” solve the captcha, and you are in. Once you are in, a pop up window will offer you to set a second factor authentication. It’s important to use it to secure your funds. You can choose SMS verification, but it’s even safer to go the second option – Google Authenticator. In order to use it, you’ll have to download their app from Google Play or App Store. The application will generate a changing code that need to be used every time you sign in. Note: In your profile you have the option to fully verify your account by sending identity docs. However, it’s not mandatory. The only limitation that you’ll have in case you don’t verify your account is only being able to withdraw up to 2 bitcoins per day. Once fully verified, the daily withdrawal limit will be raised to 100 BTC. When funding your account with this type of digital exchange, you cannot use Fiat currencies, such as USD or EURO. So first thing you want to make sure it that you have crypto coins ready to be transferred. If you don’t hold any, use one of our recommended exchanges where you can easily convert Fiat money into Bitcoin, or other coins if you prefer. For U.S citizens, we recommend going with Coinbase. For other countries, you can use Binance. The process is simple. You purchase your crypto currencies by using debit/credit cards, wire transfer or any of the other available methods. Once you have your crypto money ready, go into your virtual wallet. Choose the option for sending funds, or withdrawal, and there you should enter the address of your new Binance trading account. Here is how to find your private address in Binance: Go to the “Funds” menu and choose “Deposits.” We will assume that you use a standard Bitcoin account – type BTC in the search box and click on it. There you will see your BTC deposit address. Copy and paste it as the destination for sending your coins from your wallet. If you use an application you can use the QR code instead. The transaction time may vary, but you can check its status on blockchain.info or similar sites at any point. Now that your account is funded, you can technically start trading right away. Enter the basic exchange screen by going to the top left menu. On the top right, you’ll see the crypto currency pairs list. On top of it, use the default BTC if you use Bitcoin as your main currency. Then, all the available coins which are traded against the Bitcoin will be presented in the table below. Next, look for the currency you want using the box located above the list. When you find it, click to open its page and execute a trade. If you want to see your closed trades, navigate to the order history option on the “Orders” menu. In addition, you can see the last 24 hours history on the bottom of the main trading page. Let’s say that we want to use Decentraland (Symbol – MANA) as it was becoming stronger over the last couple of days. We are looking for the requested coin by typing MANA inside the search box. 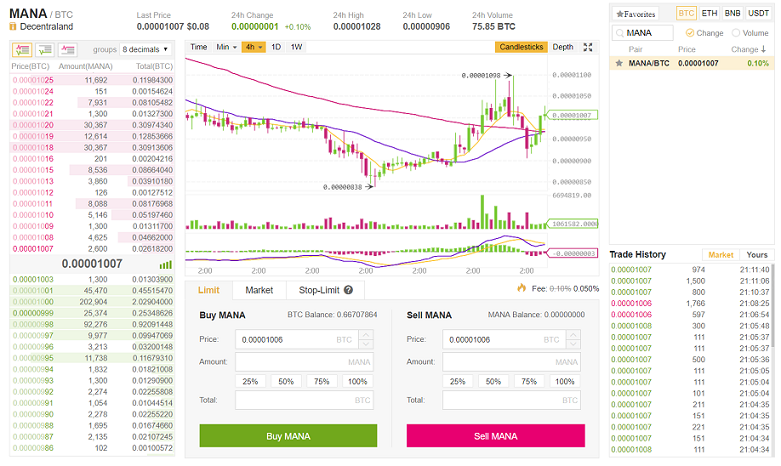 We find the MANA/BTC in the list, select it, and are redirected to the main trading page. On the left and on the right some information is displayed, showing the current bid and ask requests, and the historical trades. On the middle there’s an up to date chart, and below it is the most important area, where we execute trades. We will go to “Market” because we want to buy right now at the current market’s price which is 0.00000975 BTC. Now, all we need is to enter the amount we want to buy. 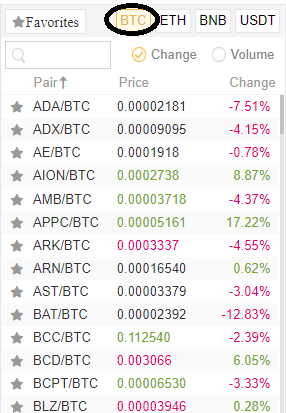 We can see the available capital for new trades next to our BTC balance. We could use a certain percentage of our free funds by clicking 25%, 50% etc, or we could specify an exact amount. In this case we will purchase 50,000. All is left is using the “Buy MANA” bottom and apply the deal. The price rose as we expected, and is currently traded at the price of 0.00001041, so we might want to sell it and realize profits. To do so, we will go the selling box and again, enter the amount we want to sell. If we want to sell it all, we fill in 50,000, or press the 100% little tab. We can also choose to sell only part of it. After choosing the amount we simply click on “Sell Mana” and that’s it. 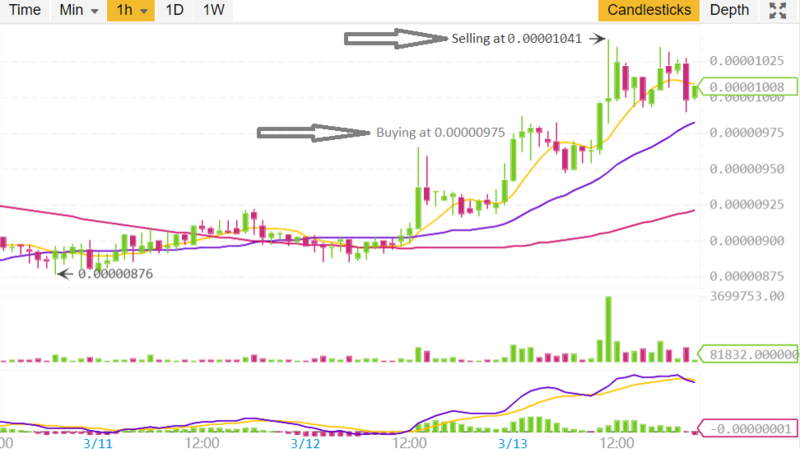 The profit we get is the difference between our buying and selling prices, multiplied by the amount of coins we bought. In our case, it turns out to be 0.033 Bitcoin, which can be currently converted to approximately 315 USD. This short guide shows you how easily you can start trading crypto currencies. Binance is one of the leading exchanges and a user friendly platform to use for this purpose. After opening an account and funding it, you can start making trades right away and with no further delay. In the example above we traded on a certain currency, however you can apply the same principle on any other. There are other features and trading tools you can use inside this crypto-currencies platform, which we will cover in future posts. Please let us know by commenting below if you have any questions and help us provide you with the most relevant information. I ended up with $315 after selling but how much did I start with in US $? Hello Paul! $315 is only the profit from this trade. So, if, for example, you started with a capital of $1,000, you would now have $1,315.